﻿ ﻿Many marketers think once a reasonable conversion rate is achieved, status quo is acceptable. Don’t fall into the conversion complacency trap. How do you improve your conversion rates month after month? Do these 11 tasks regularly to keep upping the ante because even if your conversion rate outperforms every competitor you still want better numbers. An A/B test is like a cage match without all the violence. At the end, you’ll have a clear winner. Test only one element at a time. It could be a landing page, a headline, a call to action, an image, social proof, or something else. Your lead generation tools can automate the testing and identify when it reaches statistical significance – indicating you have enough data on which to make a sound decision about what content element converts better. Understanding customers’ buying cycles can also help you improve conversion rates. Review your sales analytics to identify which content is more likely to lead to a sale. For example, which landing pages are more likely to convert to a sale? The differentiator could be the copy, the offer, or something else. Review how the landing pages differ and do more of what works better. Review your conversion rates and your editorial calendar. For instance, if you publish blog posts every Monday, Wednesday, and Friday, does one day elicit more conversions than the others? What about the content topic? Or on social media, does the posting time play a factor in conversions? Explore what works better and update your editorial calendar to reflect that. Identify opportunities to provide content incentives to further improve the conversion rate of content that performs well. For example, create content upgrades or lead magnets such as e-books, courses, calculators, or checklists that are more likely to elicit an action (e.g., submitting an email address) because they provide value for your audience. You can also offer financial incentives, such as a free gift with purchase, a coupon code, or free shipping. But don’t just leave it there. Test offers against one another. Figure out what type of incentives your audience perceives as valuable. You don’t want to copy your competitors, but you can learn how you can outdo them. Let’s say that you’re in the retail camping equipment industry. Your competitor offers a free e-book as an incentive for signing up for their email list. Your company one-ups that offer by including a free checklist along with a free e-book to entice new subscribers. Alternatively, you might realize your audience responds better to a non-text offer such as an instructional video or audio file. Always keep in mind how your audience prefers to consume content. As you get to know your audience members better, you can serve them with more relevant content and incentives. Look at what works better to move them through each stage of the funnel. For instance, if most of your audience members enter the sales funnel through paid social, ensure that the next content experience is related to how they first engaged with you on social media. Your website visitors are looking for evidence to trust you. They don’t care what you say – they care about what you can demonstrate. For instance, if you want to convert someone to a subscriber, make sure you note on the site that you have 200,000 subscribers. That’s a form of social proof that helps people feel more comfortable subscribing to your list. You likely put a CTA on home pages and product pages. But what about your blog posts? Your FAQs? Your resources page? If you create content, add a CTA. For instance, add a CTA in the middle of a blog post. Make it stand out by putting it in a brightly colored box and adding a clickable button for good measure. Incorporating an image can help too. Your value proposition isn’t what you do, how you do it, or even why you’re in the business. It’s what makes your brand special. In some cases, value propositions don’t have anything to do with the product itself. Maybe you have the best customer service ratings in your industry. Perhaps you’re known for sourcing green ingredients or materials for your products. Once you discover your unique value proposition, make it prominent on every page of your site. Cluttered or distracting website pages can reduce conversions. This is especially true when you have competing CTAs. Focus each page on a single next step. It could be signing up for your email list, visiting your product page, or following you on social media. Present as few options as possible. On landing pages, remove top navigation to see if your conversion rates increase. You might want to reduce the number of images on the page, especially when they’re not clickable, or put the CTA in a different place to capture more attention. Focus your audience. Decide what you want them to do next, then gently usher them in that direction. If you’re investing in paid search, paid social, or some other pay-per-click campaign, keep rigorous track of the results and see how your creative influences conversions. Automation is your best friend when it comes to email marketing. However, you don’t want to let those autoresponders and drip campaigns get stagnant. Go back and update them with new information, data points, and more. Make sure you’re segmenting your list correctly based on where subscribers sit in the sales funnel. Lead generation isn’t a one-and-done thing. To improve conversion rates, you need to monitor what’s working, and continuously improve and update your content assets so they resonate with your audience. 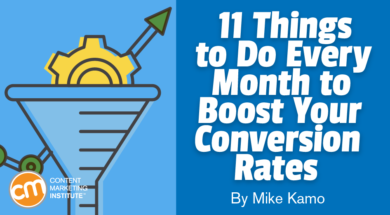 Even if you don’t tackle all 11 suggestions, ensure that at least some are on your to-do list every month so you keep your conversion rates top of mind. To grow your content marketing skills every weekday, sign up for the free CMI newsletter. Mike Kamo is the CEO and co-founder, alongside Neil Patel, of Hello Bar and Neil Patel Digital. He is a renowned digital marketing and conversion optimization expert. Follow him on Twitter @mikekamo.